Odessa is now reminiscent of the capital, Kiev - trying to start a new life after a violent revolution. Friday was a state holiday in the Black Sea city - a time to host tourists. But it became a day of sorrow, after bloody clashes between pro-Ukrainian and pro-Russian demonstrators in the city centre. Over 40 people were killed and many more injured. Now the streets of the city are decorated with black ribbons on national flags. Both sides bring flowers to honour the victims. Both say what they want now is peace. Most of the flowers are being brought to the Trade Unions House - inside which more than 30 people, thought to be anti-Kiev activists, were burned to death. There were unconfirmed reports that Russian passports and documents from Moldova's breakaway region of Trans-Dniester were found, but many believe that the victims were Ukrainian citizens. Some people are crying, many are angry. "What have they done? They took our own city from us. Fascists!" one woman shouts. "Now people call us pro-Russian activists. We are not pro-Russian, we are from Odessa. 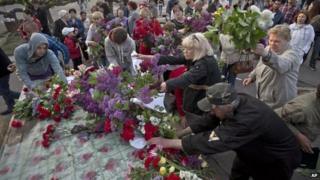 It's just about Odessa, about peace," says Anatoly, who had been at the building on Friday. "It was horror. It was annihilation of people believed to be separatists. But I am not separatist, I was born in Odessa." On Saturday he was among around 150 people who came to picket the police headquarters, demanding protection for the people of eastern and southern Ukraine from what they called "bloody terror". The protesters believe the killings were planned by the new government in Kiev and carried out by right-wing radicals, mostly from western Ukraine - a stance echoed in the Kremlin. But one elderly woman, who lives on Greek Square, says she saw pro-Russian activists attack the rally of those who support Ukrainian unity. She shows a wound under her left eye, which she says was caused by a thrown steel object. "They are terrorists, brought here from elsewhere. And the people of Odessa defended themselves, saved the city. The police just did nothing," she says. Another eyewitness says he saw shooting: "One boy was injured in his lung. He was bleeding through the mouth and died there." Another man insists this would be the "last time you will see something like that in this city", saying the people of Odessa had a right to defend their city from those he called Russian occupants. One woman at a tram stop accepted that many in the city had pro-Russian views, but added: "I support the unity of Ukraine. If you want to live in Russia - buy a ticket, pack your bag and go to Russia."